Skin cancers often start as changes to your skin. They can be new growth or from those normal looking moles. It has been estimated that about 40% of fair skinned people who live till 65 will develop one skin cancer. The best way to treating skin cancers is to catch them very early. Skin Cancers are very common in Australia. They occur when skin cells are damaged by overexposure to ultraviolet (UV) radiation from the sun. There are three main types of skin cancer but there are many other skin lesions that mimics cancers but they are not cancers. These are Basal Cell Carcinoma, Squamous cell carcinoma and Melanoma. Our doctors at Zenith Medical Centre can conduct skin checks to assist you in picking up early cancers. 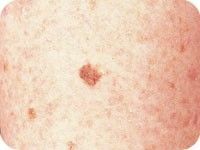 Melanoma is the most dangerous form of skin cancer. The other skin cancers are not as dangerous as Melanoma but they can be very destructive to local tissues. The earlier a skin cancer is identified and treated; the better is the chance of avoiding extensive skin surgery or, in the case of a serious melanoma or other skin cancer, potential disfigurement or even death. It is also a good idea to talk to us at Zenith Medical Centre about your level of risk and for advice on early detection. Prevention is better than cure as the sayings go. Become familiar with the look of your skin, so you pick up any changes that might suggest a skin cancer. small lumps that are red, pale or pearly in colour. If you noticed any of the above, a check up may be required to determine what type of lesion you have. We may perform a biopsy (remove a small sample of tissue for examination under a microscope). Sometimes a referral to Specialist centres may be required in cases of Melanoma and advanced non melanoma cancers.